Ensuring that your brand is front and centre in the minds of your trade customer base can be a challenge, particularly as your trade customers are such busy people who are running their own business. Sales offices, websites and mobile shopping apps do their best to sweep up as much business as possible. So, how do you differentiate, encourage loyalty and client engagement in a crowded market? 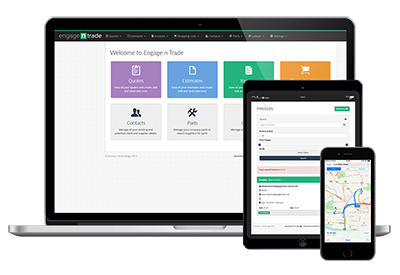 Engage n Trade is a unique customer engagement platform that encourages engagement between your organisation and your trade customers through a free mobile app. What’s more, your product set is at the heart of their business process, making it quick and easy for them to buy from you. To find out more about how Engage n Trade can benefit both you and your trade customers, go to the website. Mobile app for iOS, Android and web. Create branded quotes and invoices for your clients from your mobile.